Before Summer completely passes us buy, I wanted to share with you our busy July 4th weekend. Is anyone else having trouble keeping up with their blogging this Summer? 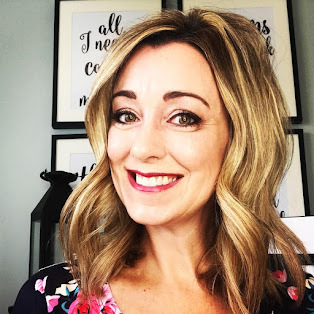 It's funny because we are so busy and I want to document it all, yet, because we are so busy, I am just not finding the time to Blog about it! Ahhh! Anyway, Friday night was relatively low key. I made chocolate chip cookies and tried to prepare in advance for the busy weekend that lay ahead. On Saturday, we headed over to my parents house to visit with my brother and my twin nieces who was back in town again from Arkansas. The Twins are getting so big!! After having lunch at my parents house, we headed back over to our side of town to attend our friends BBQ. The BBQ was held on the dock of our friends boat. 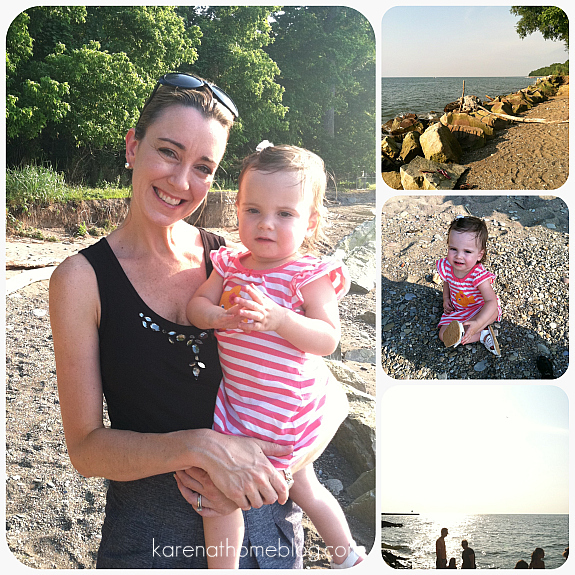 We had a blast hanging out on the shores of Lake Erie and Jillian even liked playing in the Lake Erie sand. We are so lucky to live right along the water, it's really beautiful this time of year! On Sunday, we had planned a backyard swimming play date with my neighbor, Courtney. 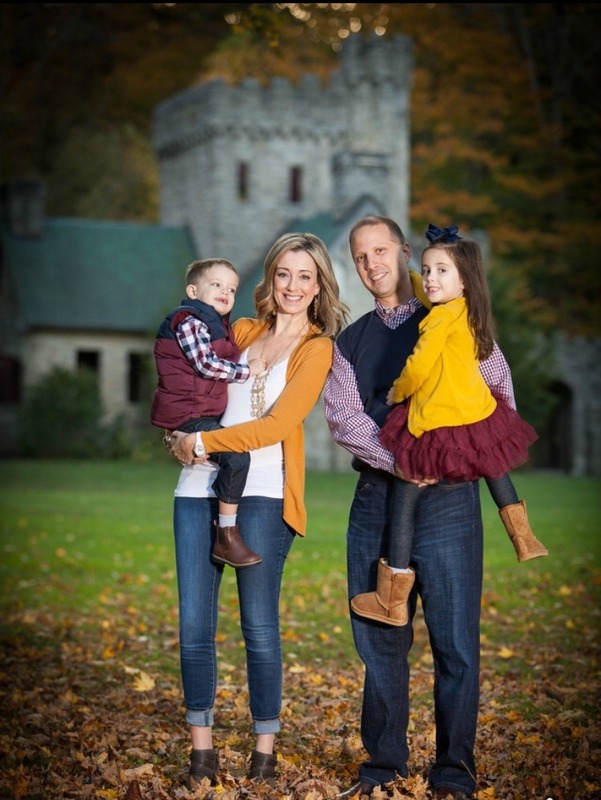 Courtney is a Mom to an adorable little boy named Gavin who is only 3 months younger than Jillian. I think Jillian has a little crush on him already which is adorable!! We had a blast although I felt like it was pretty much a comedy of errors the whole time we were there. We had literally just arrived and we're chatting and catching up in the kitchen when all of a sudden I felt something dripping on my feet. Jillian had peed straight through her swim diaper!!! It was awful, aren't these things supposed to be specially made to hold in water? Ugh!I felt horrible and utterly embarrassed. Lets hope we are invited back!!! Jillian had such a blast playing with all of Gavin's water toys even though she was missing her swim diaper and bathing suit bottoms!!! After our play date was over with, I ran to Target and cleaned out their Summer section. We are all stocked up at our house now with pools, water tables, and a blow up water ring. All ready for fun in the sun!!! Hopefully we didn't completely scare Courtney and Gavin away with the "swim diaper incident" and they will play at our house next time! 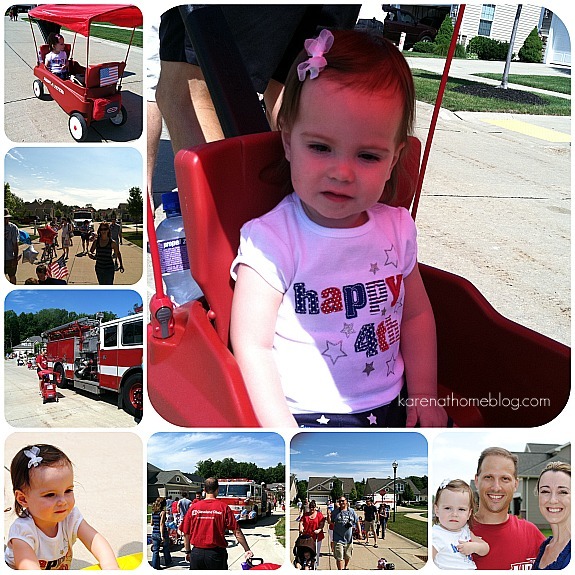 On the Fourth of July, our neighborhood planned a Fourth of July Parade for the kids. I have honestly say that I am so proud to be a part of such a great neighborhood that plans so many fun things for the kids. Over 60 kids were in attendance and I think it is obvious that a good time was had by all! The Parade was led by a Fire truck and ended with an Ambulance. Needless to say, the kids got a kick out of it. After the parade, a children's carnival was set up in one of the cul de sacs with games and even a visit from the ice cream truck! Jillian loved playing with the plastic ducks in the duck pond and would have loved to have taken them all home if she could of! I hope you all had a Happy 4th of July Weekend too! Awww! Love the updates! and the way you arranged the pictures! Is that through picnik? Sounds like a great weekend!! I hope you don't mind how hard I am laughing at the diaper incident. So funny. Gotta love diapers. So unpredictable. It sounds like a great weekend! I feel the same way about blogging this summer. It's been hard! actually swim diapers are made to do the OPPOSITE! Normal diapers hold water... and thus are heavy when they get wet... swimmers only hold in solids... I learned that one the hard way! I am joining from "Circle of Friends"
Hope to get to know you before Nashville. It sounds like a perfectly fun weekend to me! Sorry about the diaper thing but if that's the worst thing that happened all weekend, I'd be happy. SO FUN! Sounds like the perfect weekend! 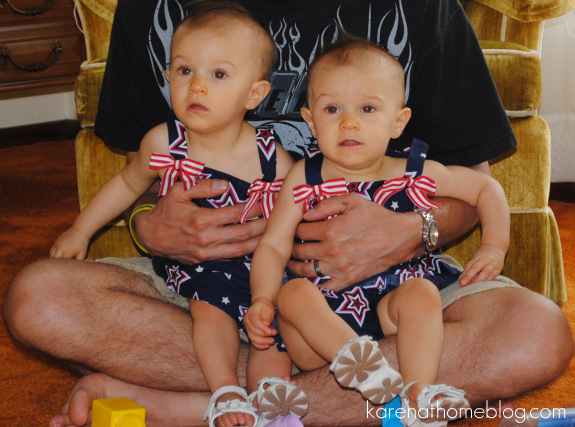 I love those cute 4th of July outfits on the twins.